Evidence to suggest Sphinx was recarved during New Kingdom? Posted: Sat Jul 25, 2009 7:55 pm Post subject: Evidence to suggest Sphinx was recarved during New Kingdom? We know subsequent pharaohs often usurped monuments of their predecessors. 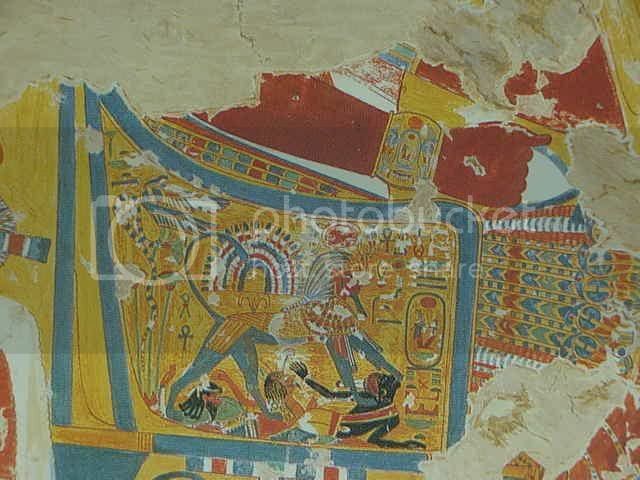 As far as I know, this was usually by replacing the 'old pharaoh's' cartouche with the cartouche of the usurper. Is there any evidence of statuary actually being recarved into the image of the usurper? Building on this, like the topic states, does anyone know if there is legitimate evidence to suggest the head/face of the Sphinx was not only restored during the New Kingdom but also usurped and recarved? This could possibly explain why the head seems too small and out of proportion to the body. There's an interesting discussion here online. The short version is that El Mahdy has suggested that possibly Tuthmosis IV not only placed the dream stela between the paws after clearing the monument of excessive sand, but may have also done a touch up on the face. I don't know enough about the Egyptian language to say what the proper translation is and if there is a suggestion of a recarving, but it sounds interesting. I'm not sure what would have caused Tuthmosis IV to recarve the head though. Unless it was so severely weatered / damaged that it was necessary? The Sphinx had an twisted gods beard (see fragments in London : EA 58 ---> http://www.britishmuseum.org/explore/highlights/highlight_objects/aes/f/fragment_of_the_beard_of_the_g.aspx and Cairo). I don't know what you mean by "twisted", Lutz. The portion in the BM is just the usual braided false beard. Actually, the dis-proportion of the head compared to the body is a very stong suggestive element that the head was re-carved at some time. Anneke's suggestion of a "touch-up" makes sense. With "twisted" I mean "twisted" (German : "geflochten" and French : "tordu"...). After some thinking about now I know what the problem was : misunderstanding in translation, sorry. Braided (not twisted) is the right word in English for German "geflochten". i heard somewhere that the sphinx used to have wings. is this true. if so what happened to them. I have never heard of the Sphinx in Giza having wings. And I think that having stretched out wings would be almost impossible the sculpt at that scale? Actually, a typical Old Kingdom beard is not braided (or twisted). It is corrugated (ribbed). In other words, it has horizontal lines across the front. The Sphinx head was probably recarved two or three times at least. It probably resembled Pharaoh Khafra originally, but today it looks like Pharaoh Senwosret. Petrie thought it resembled a Middle Kingdom pharaoh. The beard was probably attached during the New Kingdom (or even later). I tend to believe that the original scupture of the sphinx was actually Anubis. A very convincing book has been written about this, but I forgot the name. I'll post it later. I tend to believe that the original scupture of the sphinx was actually Anubis. A very convincing book has been written about this, but I forgot the name. I'll post it later.